AT&T Park in San Francisco. Add the San Francisco Giants to the growing list of Major League Baseball teams improving fan safety at games. 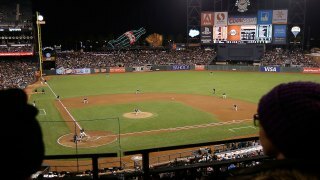 The team will add more netting to the field-level seats at AT&T Park to protect fans from foul balls and loose bats, Giants officials confirmed late Friday. Three other teams (Cincinatti Reds, San Diego Padres and Seattle Mariners) on Thursday pledged to make a similar move. The decision comes after a foul ball traveling 105 mph hit a young girl at Yankee Stadium in New York this week. She was seriously hurt, but her injuries are not life-threatening. Henry Schulman of the San Francisco Chronicle was first to report the Giants' decision to add more netting. The Giants are expected to make an announcement next week.